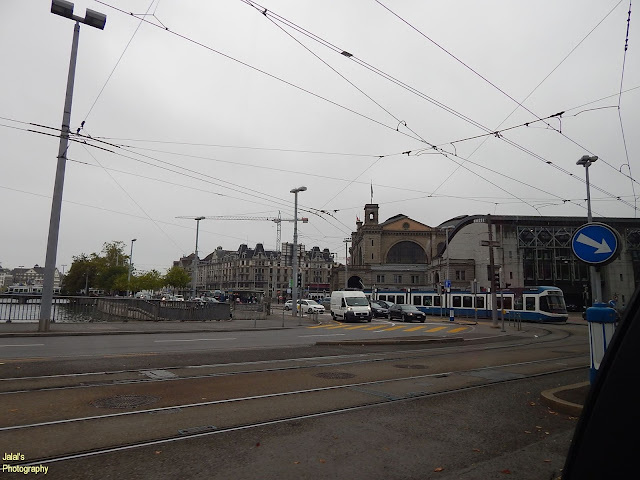 So after the coffee morning in the clear fresh air of Lichtensteig, Switzerland, we headed towards Zürich - our only one-day destination in Switzerland. 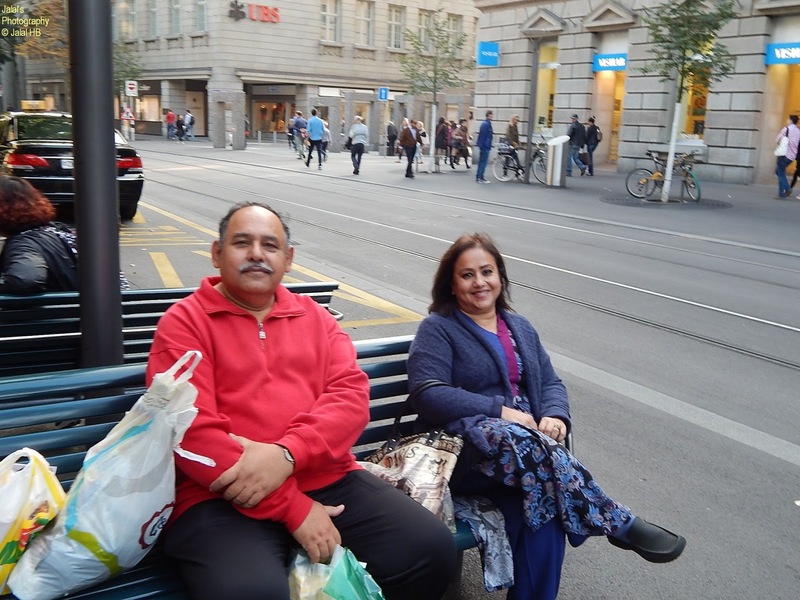 I will always regret that we did not have time to move about Switzerland and visit Geneva and Basal besides the snow covered Alps, due to our very compact and tight schedule limited by studies of my son back in Germany. So we were to make the best use of our visit to Zürich and fortunately we had the entire day to ourselves. So we divided the day into three sections: Visit to Zürich city central including its railway station which has a city of its own in its basement, the Zürich Lake and a ride in the steamer, and finally the ongoing Zürich Film Festival at that time of the year. 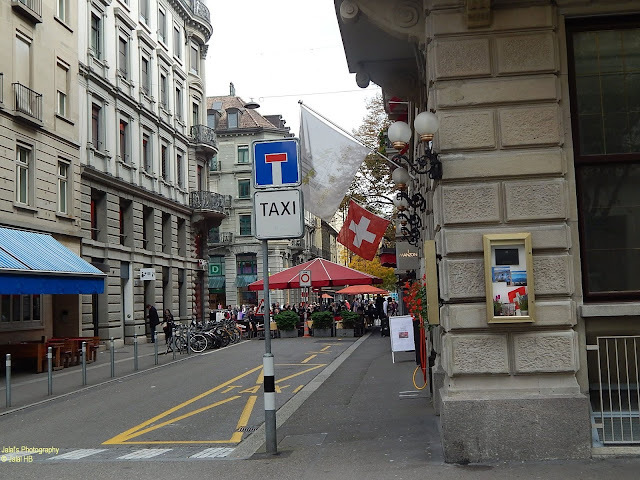 Hitting the city centre straight, thanks to the very accurate navigation system of our rented BMW, the immediate worry was to find a suitable parking. It wasn't possible on any roadside parking as the city centre was packed to its capacity - so we got a slot in one of the parking lots with many stories after taking a number of turns. 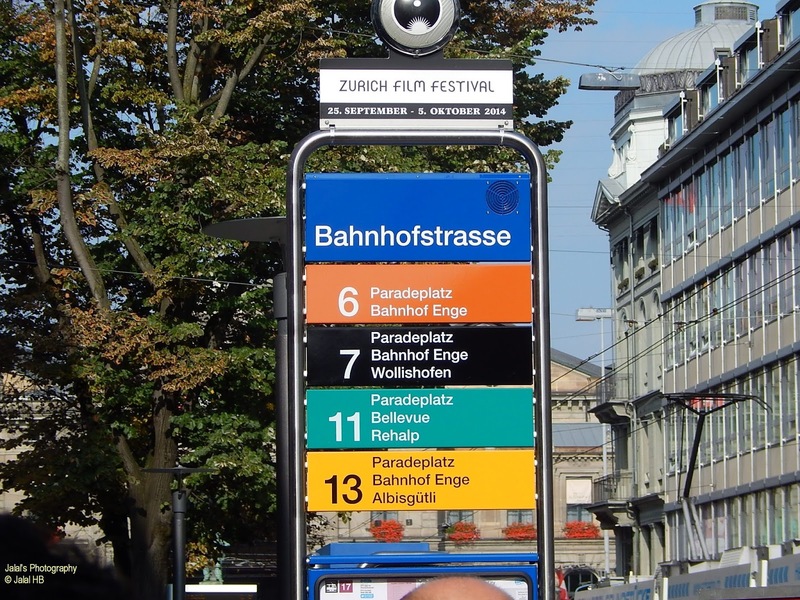 That solved our major worry and we hurried to the main downtown boulevard of the city center or the Bahnhofstrasse - the Station (Bahnhof) Street (Strasse). 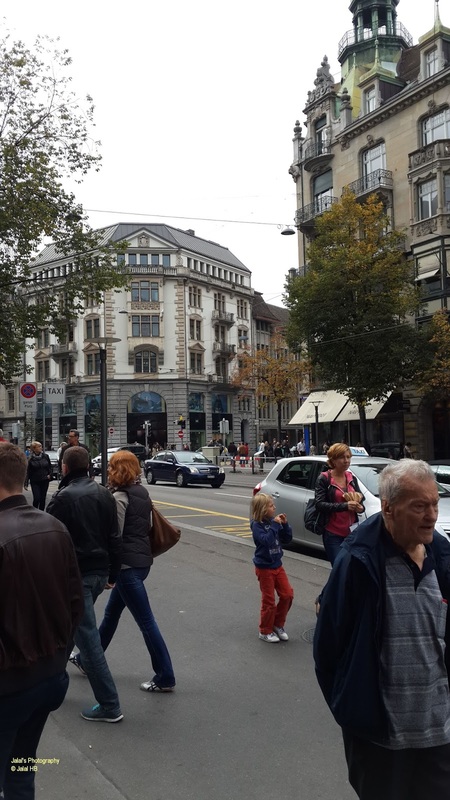 The city centre was already jam packed with tourists from all over the globe and busy 'window shopping' and taking photos. 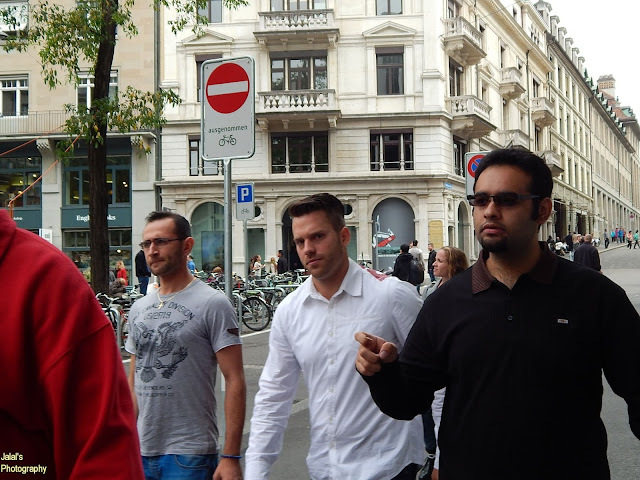 Yes Window Shopping for Zurich and even Switzerland as a country is one of the most expensive in the world - even expensive that the much talked about fashion street of Paris: The Champs Elysees. 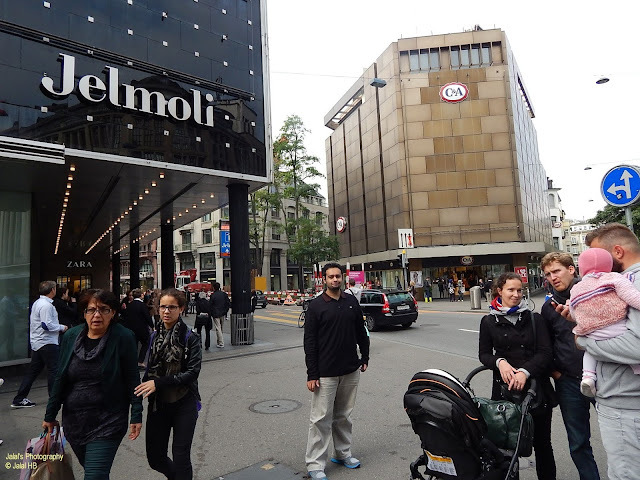 Most of the shops here sell international brands like Armani, Gucci and Cartier. 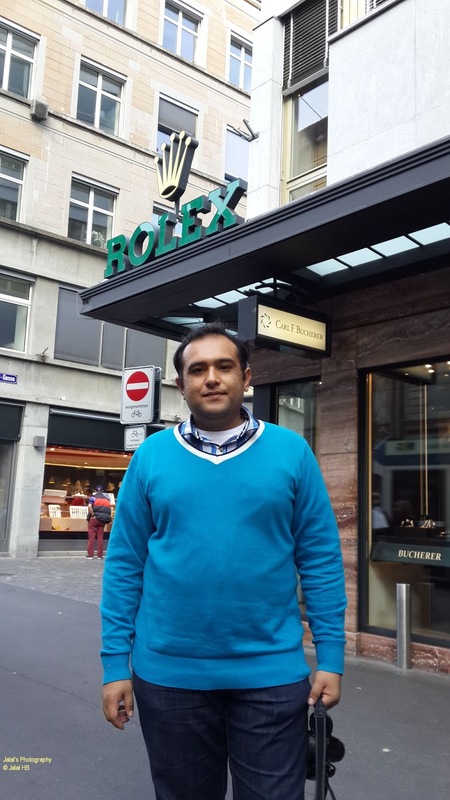 The real Rolex is sold here!! 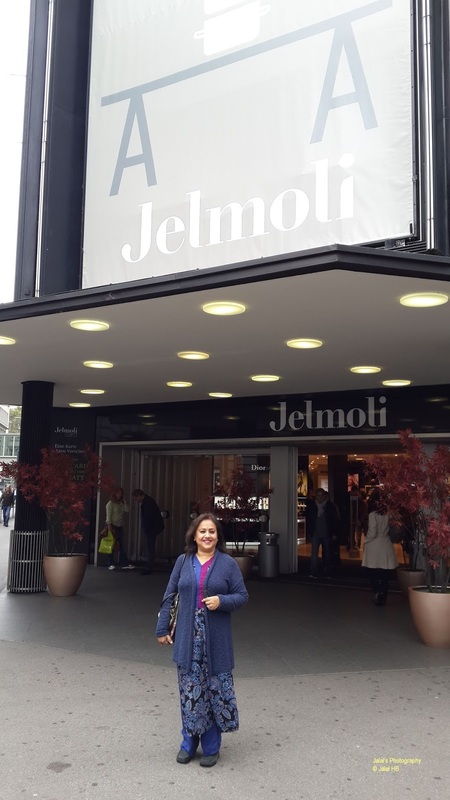 While my sons strayed away in the streets and shops of their choice, I had to trail my wife into various malls like Jelmoli for her to find some jewellery, bags or shoes. 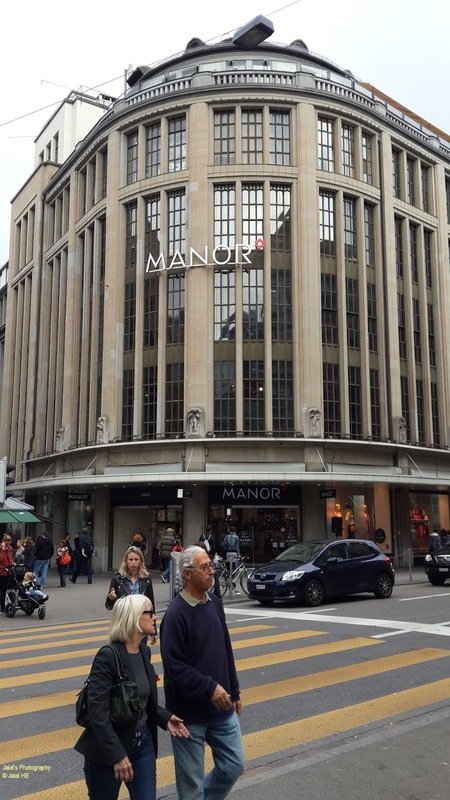 And as cautioned by friends in Germany, the malls and their glittering shops were best suited for the window shoppers as the prices were far beyond the budget tourists like we who were visiting for sightseeing and certainly not for shopping and that too in Switzerland. And no wonder we were on the Bahnhofstrasse - Zurich's main downtown street and one of the world's most expensive and exclusive shopping avenues. So after being satisfied that there was 'hardly' anything that we wanted to buy, we settled for roadside eateries and had something to munch. 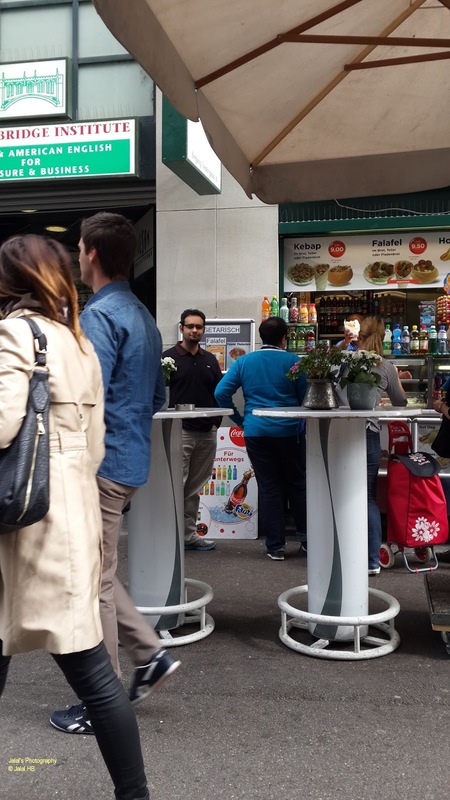 The Turkish eateris came to our rescue for halal food and we found these palatable to our taste and suiting our pocket. 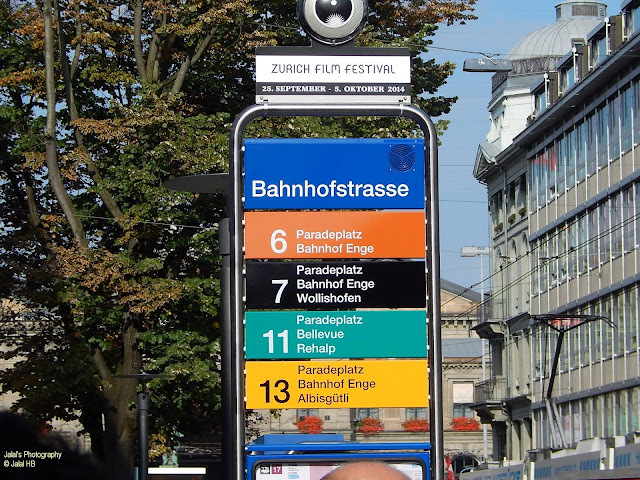 How old is Bahnhofstrasse - well not decades but centuries old. It was build in 1864. The development as a tourist attraction picked up impetus with the construction of the main railway station between 1865 and 1871. 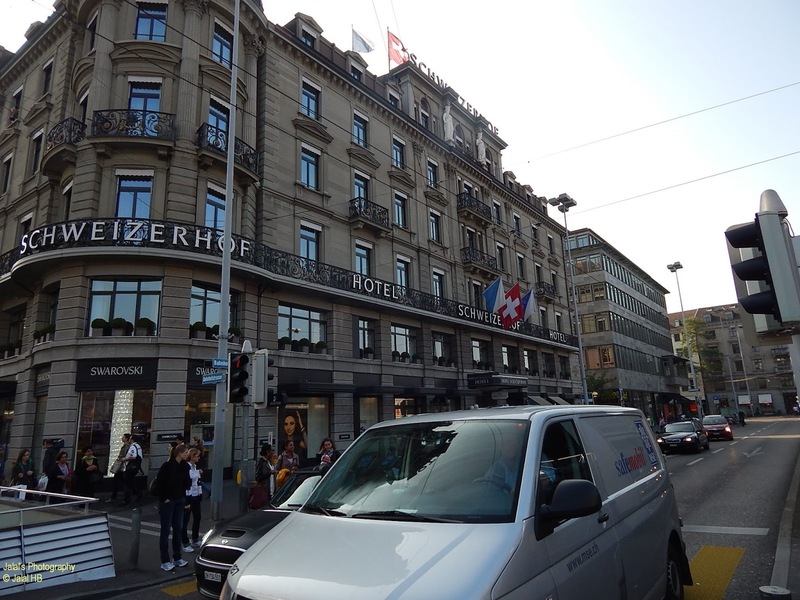 However, some buildings were there even before trhe street came into being like the Sprüngli House built in 1858, much earlier than the store of Otto Ganz and 1899 the Jelmoli Glas Palace. 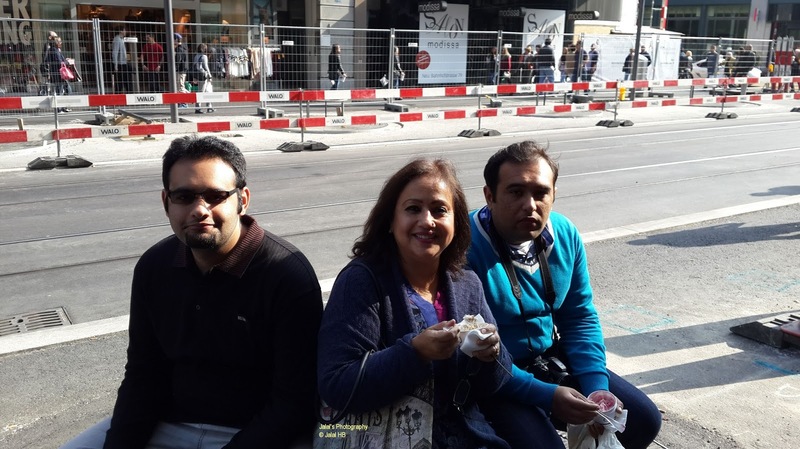 There were all kind of tourists from God knows which countries but it was fun watching them moving, sitting, enjoying and shopping. 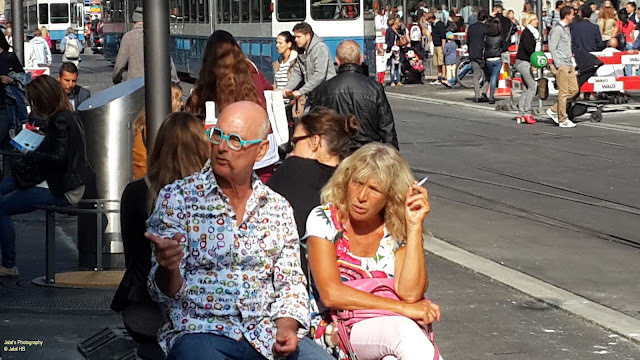 One of the best couple that I saw was the one above - I liked the old man for his colourful shirt and the glasses with one round and the other square glass. One should dress up lightly and colourfully besides some ingenuity like the glasses of the man above. 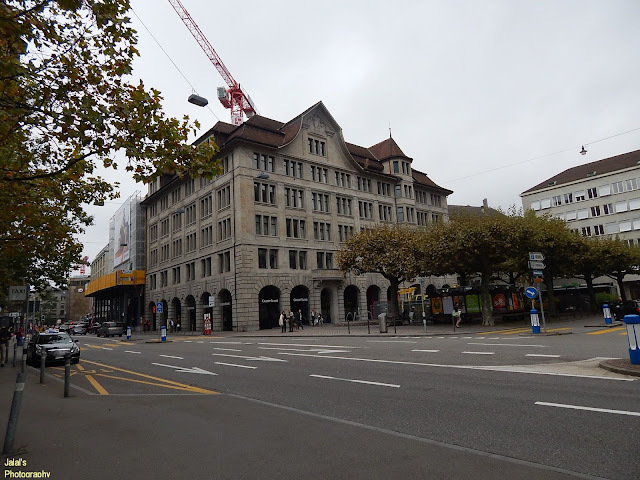 The statue on the main Bahnhofstrasse is that of Johann Heinrich Pestalozzi (1746-1827), who was a Swiss pedagogue (born in Zurich) and Romantic educational reformer. He was of the view education must be radically personal, appealing to each learner's intuition. His motto was “Learning with the head, hand and heart”. 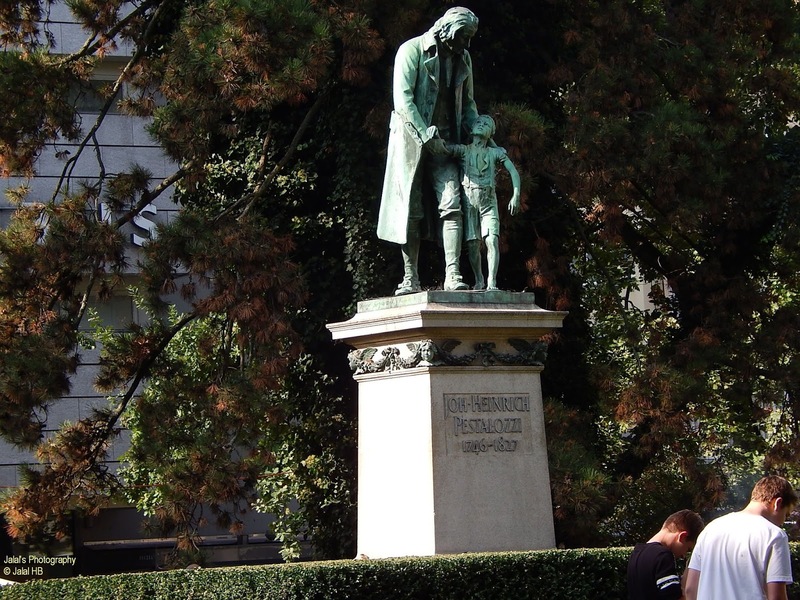 Here in the monument photographed above, called Pestalozzi Monument, erected 1899, Pestalozzi is depicted as leading a poor boy who is barefooted and wear ragged. The monument was made by design of sculptor Hugo Siewert. 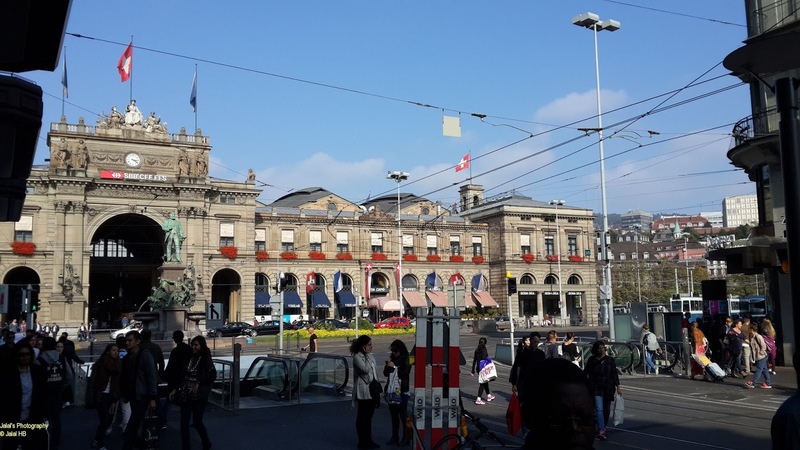 Paradeplatz, one of the most famous squares in Switzerland, is situated towards the end of the Bahnhofstrasse closest to Lake Zurich. 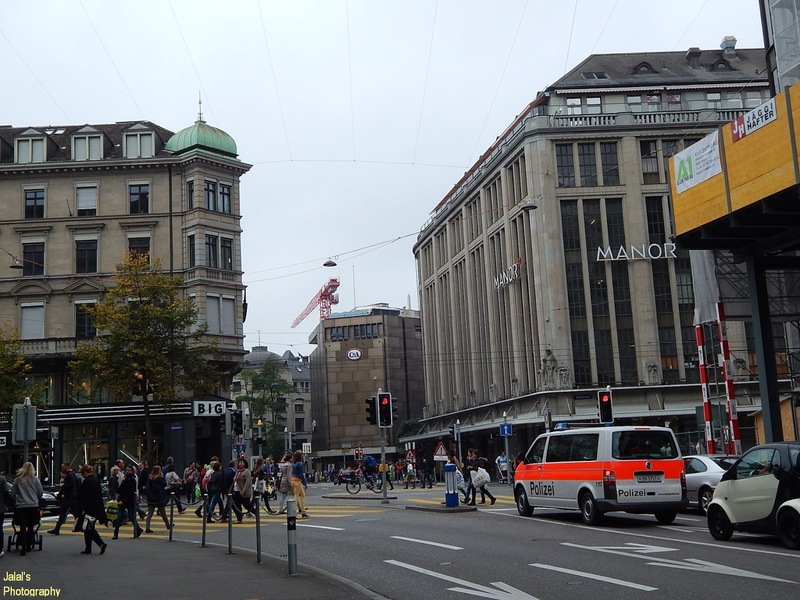 The Bahnhofstrasse is also the location of many Swiss and international banks and a center of the financial industry. The two biggest Swiss banks, UBS and the Credit Suisse Group, have their headquarters there. 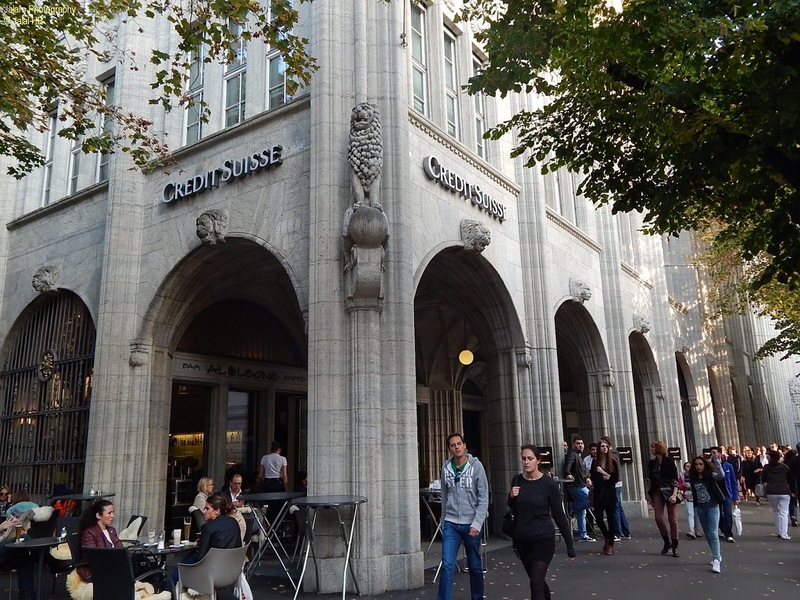 Paradeplatz is also known for its chocolate shop and cafe, Confiserie Sprüngli. 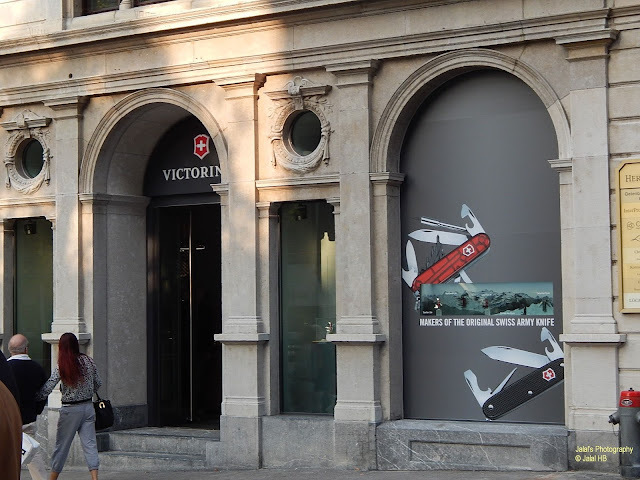 There were all major brands in the city center - from famous Swiss knives, did not buy as I already have one, to Rolex, and wow: Bata. 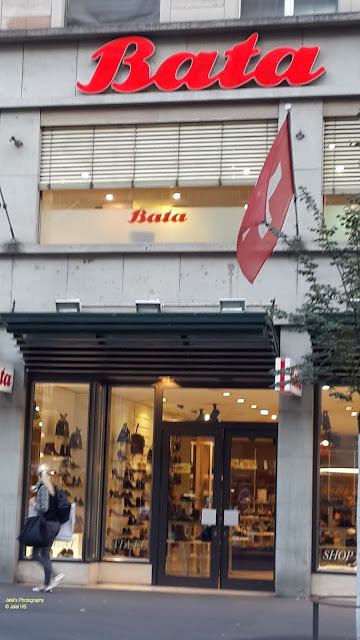 I never thought I would come across Bata in Zurich - a shoe we grew up wearing since our childhood. 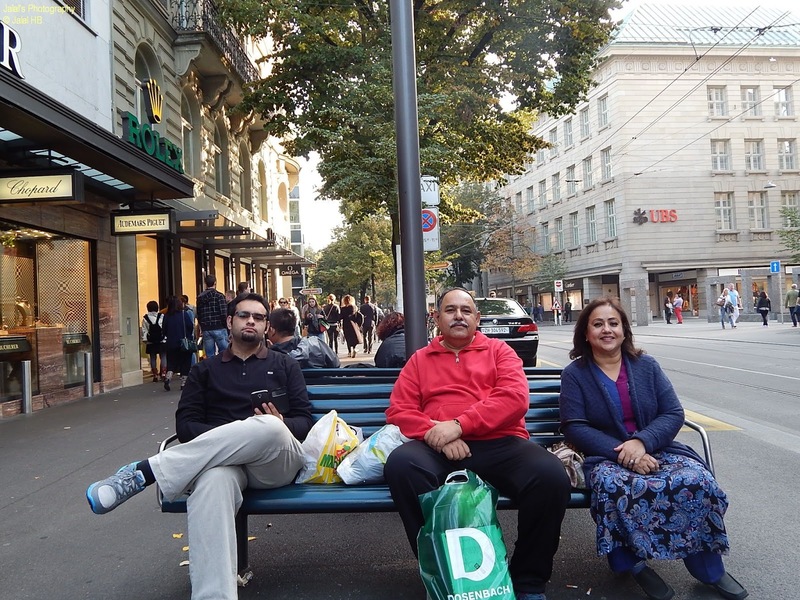 Walking and walking and window shopping took quite a heavy toll of us as we had walked almost to the end of the main street leading to the central railway station. Before moving on it is was prudent to have a rest and a few photos.